North South Line: Train services between Orchard and City Hall stations will operate at a longer frequency till 7am. North South Line: There is no train service between City Hall and Raffles Place stations till 7am. Affected commuters may board the East West Line instead. 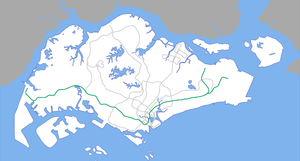 East West Line (EWL) is the second Mass Rapid Transit (MRT) line. Traveling from one end to the other takes about 80 minutes. The line is currently 56.7 km long with 35 stations, making it the longest MRT line. 27 May 2018 Switched from Fixed Block Signaling system to Communication Based Train Control Signalling System.
. However, the official code for Tanah Merah remains as (EW4). Special Pasir Ris Yew Tee Operates during evening peak hours in the event of longer waiting times along NSL. The rolling stock consists of Kawasaki Heavy Industries C151, Siemens C651, Kawasaki Heavy Industries & Nippon Sharyo C751B, Kawasaki Heavy Industries & CSR Qingdao Sifang C151A, Kawasaki Heavy Industries & CSR Qingdao Sifang C151B and Kawasaki Heavy Industries & CRRC Qingdao Sifang C151C trains. These trains operate from three depots along the line, Ulu Pandan Depot near Jurong East station, Changi Depot near Tanah Merah station and Tuas Depot near Tuas Link station. ↑ "Tuas West Extension Opens on 18 June 2017". Land Transport Authority (27 April 2017).